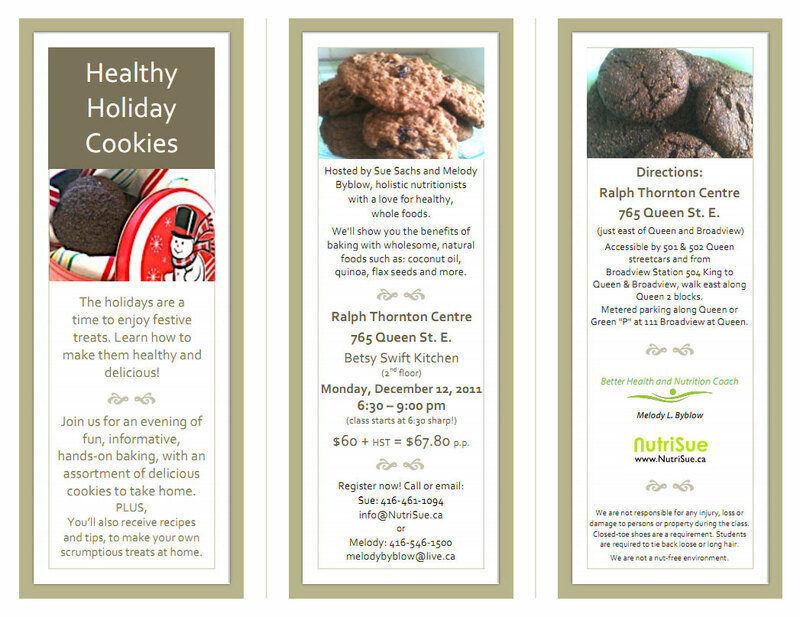 I hope you can all make it to this hands-on Holiday Cookie Workshop on December 12, 6:30 – 9 pm at the Betsy Swift Kitchen at The Ralph Thornton Centre. Learn to make some delicious holiday treats the healthy way. The majority of our ingredients will be organic (except for baking soda, sea salt, etc. – but they will be good quality! ), and we’lll talk about the benefits of using ingredients such as coconut sugar, flax seeds (as a substitute for eggs), coconut oil, quinoa flour; how to make delicious vegan cookies for the whole family, and more. Plus, you will take home an assortment of cookies, as well as recipes and tips so that you can make our treats at home. (click on the image below for all the details).